For me any time is a good time for soup – it’s like ice cream; it can never be too cold or too hot to enjoy it. 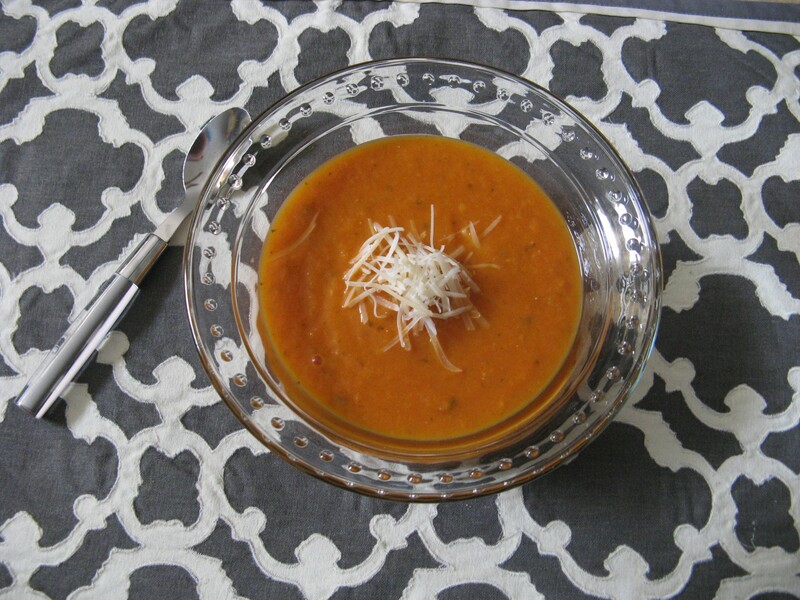 Especially since there are so many varieties of soups that can be enjoyed either hot or cold. But these days with the temperatures being so cold and every few days there is some sort of wintry mix falling from the skies hot soup is definitely the way to go! The other day while picking up some produce while grocery shopping – this is a common place (the produce section) where I get some of my cooking / baking ideas – the idea of making roasted tomato soup popped into my head. I had no idea what ingredients I needed but I figured tomatoes would be a good start and some basil. I knew I had the other basics at home that I assume I would need – yellow onions and garlic. I didn’t think I needed any specific type of tomato – i.e. 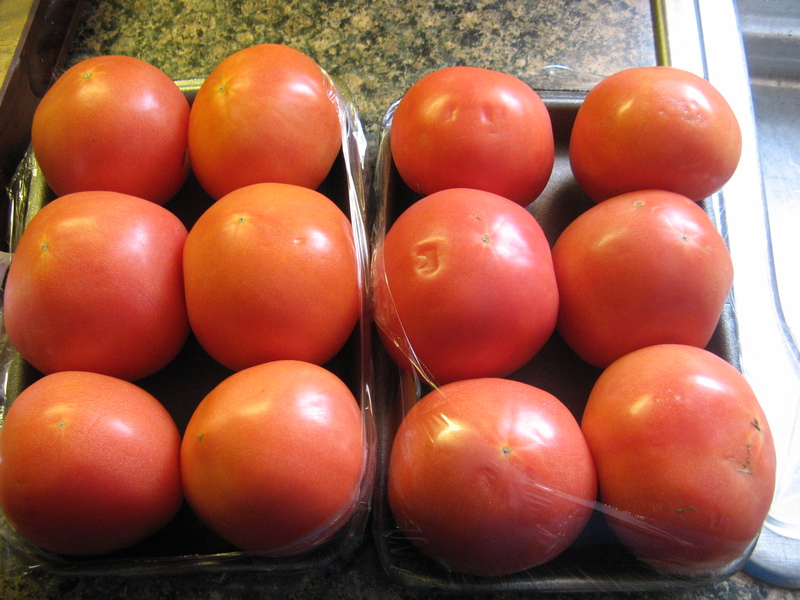 plum, beefsteak, etc… – so I picked up a pack of six tomatoes but then when I got home and did some research I soon realized that I needed double that amount so I picked up another pack of six tomatoes the following day and I was ready to go. 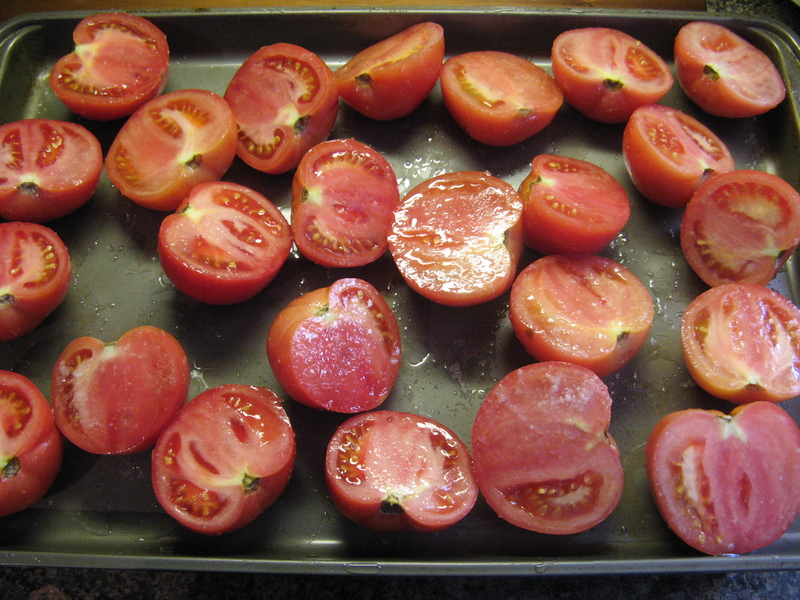 I began by slicing the tomatoes in half and tossing them with olive oil and kosher salt and placing them on a baking sheet. I then roasted them in a 400 F preheated oven for about 45 minutes. While the tomatoes cooled I chopped two yellow onions and minced four garlic cloves and sautéed both in two tablespoons each of unsalted butter and olive oil over medium heat. 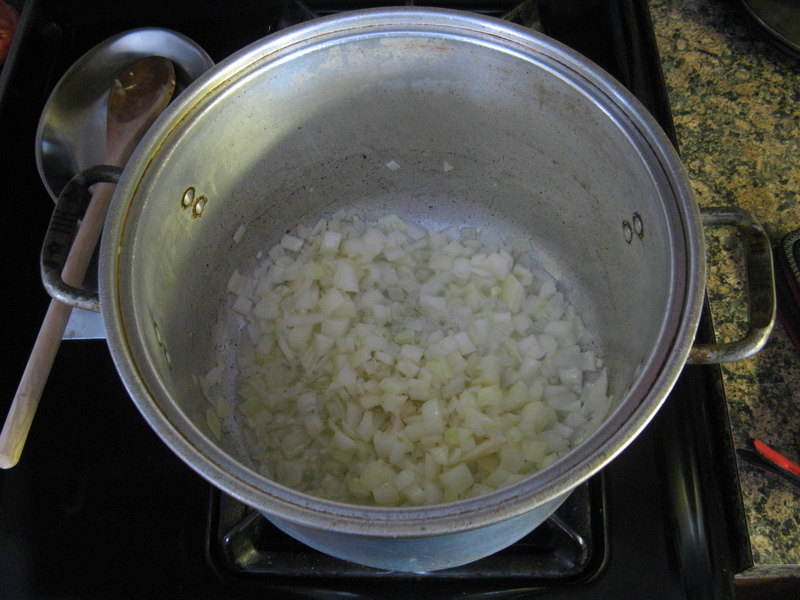 The smell of sautéing onions and garlic is probably one of my favorite aromas when it comes to cooking. 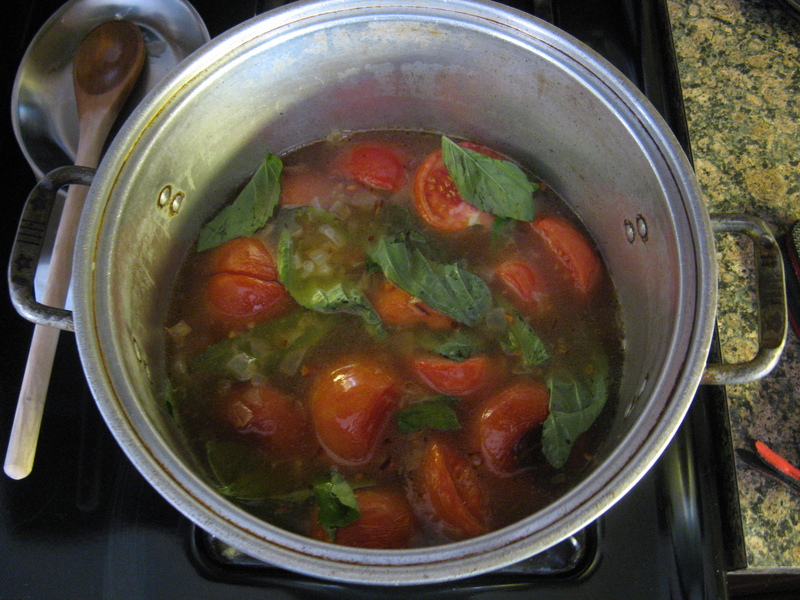 Following that I added a quart of vegetable broth – I used College Inn’s Garden Vegetable Broth – the tomatoes and ten large basil leaves to the onion mixture. I brought the soup to a boil by raising the heat to high and then lowered the heat so the soup could simmer uncovered for about thirty minutes. I did a taste test and I already knew that this soup was a winner… The broth had a wonderful taste with a hint of the basil. I removed the pot from the heat and used an immersion blender to blend the mixture into a delicious creamy soup that still had bits of the basil in it. I seasoned it with some fresh ground pepper and it was ready to be enjoyed. While the soup was meant to be for dinner, I couldn’t wait to try it so I ladled a few spoons into a bowl and topped it with some shredded parmesan cheese and I was very happy with the result. I enjoyed a second bowl a few hours later along with a grilled cheese! 1. 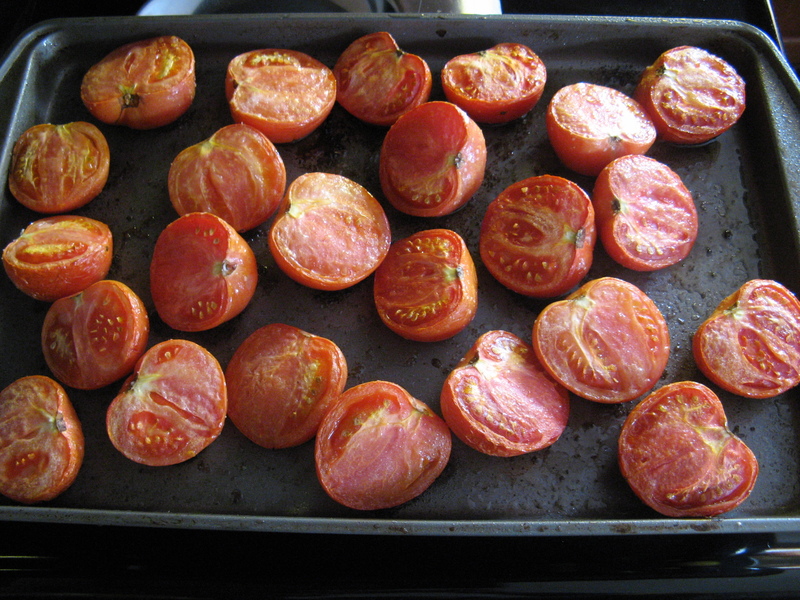 Preheat oven to 400 F. Toss tomatoes with olive oil and salt and spread on a cookie sheet in a single layer and roast in the oven for 45 minutes. 2. Sauté the onions and garlic in 2 tablespoons of olive oil and the butter over medium heat for about 10 minutes, until the onions begin to brown. 3. Add the vegetable broth, tomatoes and basil to the onion mixture and raise the heat to high and bring the mixture to a boil. 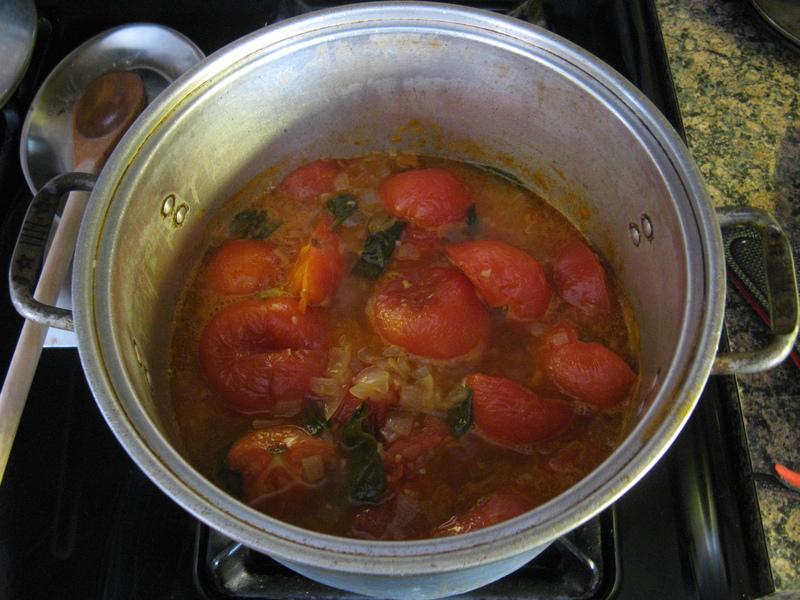 Lower the heat to low and simmer the soup uncovered for about 25 – 30 minutes, the tomatoes will looked stewed / poached. 4. 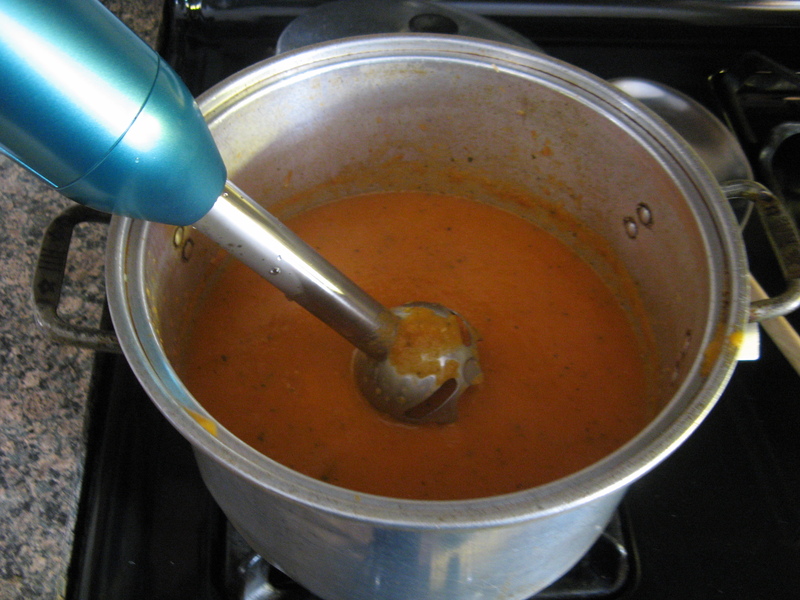 Blend the soup with an immersion blender, or blend in a blender or a food processor, until the soup is creamy and all of the tomatoes have been blended. Season with salt and pepper. Fantastic👍 post, love the soothing tomato soup, so comforting on a cold winter evening. Just yest afternoon I oven dried tomatoes and have stored in a jar covered in olive oil, your pictures reminded me of my afternoon 😃. Super comforting soup on a cold winter night! Just a day before I too dried the tomatoes in oven, your pictures brought back that scene. Loved your recipe, thanks for sharing. Thanks for your comments! The tomatoes you made sound amazing.